Rebecca Metzler has earned her Ph.D. in physics at the University of Wisconsin Madison and is starting a tenure-track faculty position at Colgate University in the Fall. Ana Houseal successfully defended her thesis this month, and now has a Ph.D. in science education from the University of Illinois Urbana-Champaign. Sarah Saffa is starting a Ph.D. program at a university in New Orleans. Nicole Drummer PR-ed in the Platte Half-Marathon last weekend. Read her race report and consider donating to the Leukemia & Lymphoma Society through her Team in Training Site. She will do the Moab Century in September 2010. Kelley Hess and Stephanie Hutson are participating in triathlon collegiate nationals this weekend. Congrats and we're all looking forward to reading their race reports! 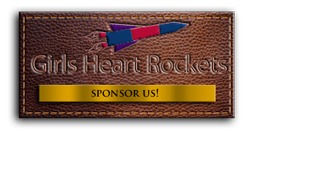 Stephanie Law, a physics graduate student at the University of Illinois Urbana-Champaign, will join Girls Heart Rockets for the first time this October as a member of the Bourbon Chase team. Grace Pedersen, who joined us as the female champs in River-to-River 2009, has also joined the Bourbon Chase team. On that note, check out p. 7 of the 2010 River-to-River Handbook.